Glaciers and ice sheets are perennial accumulations of ice and snow that flow downslope, slowly, due to their own weight. These terrestrial (land-based) ice masses often are classified by size as either glaciers, ice caps, or ice sheets. At the present time, perennial ice covers about 10 percent of Earth's land surface. Glaciers, the smallest of the terrestrial ice masses, originate in high mountain basins, called cirques, or may be fed by ice caps or ice sheets. Glaciers flow within mountain valleys. Although glaciers are generally thought of as polar entities, they also are found in mountainous areas throughout the world, on all continents except Australia, and even at or near the Equator on high mountains in Africa and South America. Ice caps are small, high-altitude ice masses that form when glaciers completely fill their subglacial valleys and coalesce (join together). Ice sheets also blanket the land surface but are much larger than ice caps. The Antarctic ice sheet covers millions of square kilometers and in places can reach more than 4 kilometers (2.5 miles) in thickness. Parts of the Greenland and Antarctic ice sheets rest on bedrock that is near or below sea level; other parts are pushed out to sea where they calve (break off), forming icebergs. Ice sheets form only at high latitudes, whereas glaciers are found from the poles to the tropics. A glacier moving down a valley changes the shape of the valley sides and floor. When a glacier reaches the ocean or a large lake, large pieces can break off, or "calve," to form icebergs. Smaller pieces of ice are known as bergy bits and growlers. The temperature of ice within a glacier changes with depth. Snow falling on the surface of a glacier is the same temperature as the air at the surface. As more snow falls, the older snow is pushed down into the glacier, taking that surface temperature with it. In polar regions, where air temperatures are very cold, ice near the surface of a glacier is also very cold. But with depth, ice temperature increases because the ice is being warmed from below by geothermal energy from Earth. Many alpine glaciers are isothermal (of a nearly uniform temperature), and are very near the melt temperature throughout. Glaciers are big conveyors, moving ice and rock from a high-elevation accumulation zone to a lower-elevation ablation zone. The accumulation zone is that part of the glacier, ice cap, or ice sheet on which the prior winter's snow persists through the summer season. In the ablation zone, summertime melting removes the winter snow and perhaps some of the underlying glacier ice as well. The boundary between the areas of net accumulation and net ablation at the end of the summer season is called the equilibrium line. The downstream terminus (end point) of a glacier is found where the rate of ice flow is equal to the rate of ablation. Where the glacier ends in the ocean or a lake, mass also is lost to iceberg calving. Ice flows like a very thick fluid. While very near the surface, a glacier is brittle and it cracks; but deeper within the glacier, the weight of the overlying ice causes the ice crystals to creep past one another, to "deform." A glacier can be imagined as a deck of cards, on which pressure is applied from above. Pushing down slowly on the deck at a small angle causes the higher cards to slide past the lower cards. The same pattern emerges in most glacier ice: flow is fast at the top of the glacier and decreases toward the base, even to zero if the glacier is frozen to the subglacial bedrock. The rate at which a glacier deforms depends on its thickness (i.e., its weight), its surface slope (think of the angle at which a deck of cards is pushed), and its temperature. The warmer the ice becomes, the faster it deforms. In locations where the basal ice warms to the melting point, the resulting liquid helps the glacier to slide over its bed. 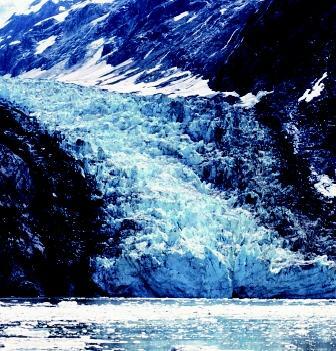 Glaciers transport large volumes of sediment and rock over time. The rock material may be carried at the surface, in the interior, or at the base of the ice. All sizes of rocks are carried together. Eventually, the ice-transported sediments are deposited at the downstream edge, along the sides, or at the base of the ice (due to melting). These deposited sediments are called glacial till. Unlike water-deposited materials which are well-sorted, glacial deposits are unsorted, which means that the sediments are deposited just as they were carried, as a mixture of sizes. As glaciers move over bedrock, they sculpt the surface by grinding and polishing rock surfaces and by plucking blocks of bedrock from the overridden outcrops. This photograph shows the contact between one small area of the Mendenhall Glacier and the rocky ground of southeast Alaska. moraines are layers of glacially transported sediment that melt out from the base of the glacier, blanketing the bedrock. On a larger scale, till sheets form where sediments carried near the bottom of an ice sheet melt out, to be left behind on the subglacial bedrock. Till sheets cover much of the upper midwestern United States, leaving a record of the past glacial ages. Unglaciated valleys often have a "V" shape because loose rocks weathered from higher elevations pile up along the valley walls. 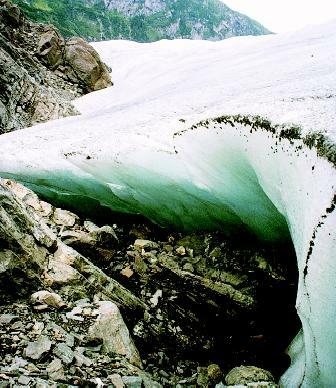 Glaciers remove those piles and wear down the bed beneath, changing the "V" shape into a "U." Ice sheets smooth the land surface, and where they flow over large bedrock bumps, they smooth the upstream sides and steepen the downstream sides. The downstream steepening is due to a process called plucking. In that process, meltwater formed on the upstream side of the bump flows around to the downstream side, where it may refreeze, helping to wedge loose rocks from the hill. The bottom of the ice sheet then freezes to the loose rocks and carries them away, steepening the downstream end of the bump. The smooth bedrock feature that results is called a roche moutonée (sheep rock) and it, too, can be used to infer past ice-flow direction. SEE ALSO Glaciers, Ice Sheets, AND Climate Change ; Hydrologic Cycle ; Ice Ages ; Ice at Sea ; Ice Cores and Ancient Climatic Conditions ; Weathering of RO CKS . Andersen, B. B., and H. W. Borns. The Ice-Age World. Oslo, Norway: Scandinavian University Press, 1994. Benn, Douglas I., and David J. A. Evans. Glaciers & Glaciation. London: Arnold, 1998. Paterson, W. S. B. The Physics of Glaciers, 3rd ed. London, U.K.: Elsevier/Pergamon, 1994. U.S. Geological Survey. Satellite Image Atlas of Glaciers of the World. USGS Professional Paper 1386-J. Washington, D.C.: Government Printing Office. Ice of All Shapes and Sizes. Rice University. <http://www.glacier.rice.edu/land/5_iceofallshapes.html> . * See the "Ice Ages" entry for a photograph of glacially-smoothed bedrock at Peggy's Cove, Nova Scotia, Canada.